KARACHI: President Dr Arif Alvi on Saturday said Pakistan and Turkey were likely to sign a free trade agreement (FTA) soon, which would boost their bilateral trade. "During my recent visit to Istanbul, I talked to Turkish President Tayyip Erdogan on the FTA. Seven meetings had been held in the past, but the FTA could not be finalized because of certain concerns shown by Turkey. “Now, these hindrances will be removed and the FTA will be finalized soon," he added. 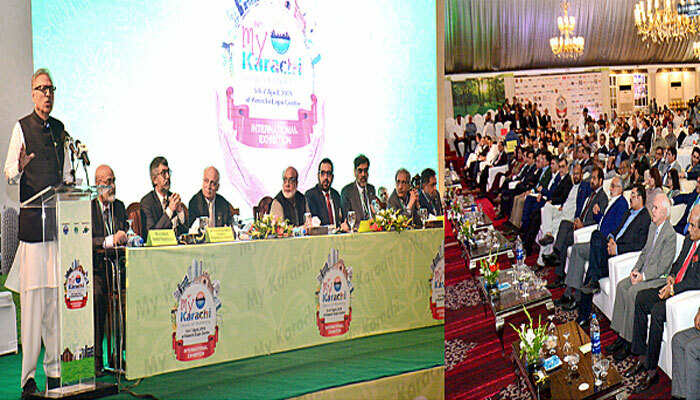 The president was speaking at the launching ceremony of 16th International "My Karachi : Oasis of Harmony" exhibition-2019 at a hotel here. The 3-day international trade event will be held on April 5-7, 2019. The Karachi Chamber of Commerce and Industry (KCCI) has been organizing the international exhibition every year since 2004 to project Pakistan’s soft image and potential before the world ; especially the West where negative propaganda about the country was at its peak. Chairman Businessmen Group Siraj Kassam Teli, KCCI President M Junaid Makda, former KCCI president Haroon Farooki, M. Zubair Motiwala, Anjum Nisar, Iftikhar Ahmed Vohra, A. Q. Khalil, Tahir Khaliq, Myjed Aziz, M. Younas Bashir and M. Jawed Bilwani and KCCI Advisor on Electrical Affairs Engr Wali Muhammad Rahimoon were prominent among those who attended the ceremony. The president said his Turkish counterpart agreed that more serious and concrete steps were needed to be taken for increasing bilateral trade, which had decreased to $600 million from $1billion per year. He said the Turkish government, business community and the people in general gave great importance and respect to Pakistan and its citizens. Turkish investors were keen to invest in various sectors in Pakistan, he added. Four Turkish companies, he said, were ready to bring $1.5 billion investment to Pakistan. However, there were certain issues needed to be addressed before their arrival, he added. Albania, who is a member of European Union, also expressed deep interest in Pakistan''s goods trade to European countries through Albania after some value-addition there. Dr Alvi assured that the Pakistan Tehreek-i-Insaf leadership would honour its promises and commitments which it made with the trade and industrial community before the general election. Besides better law and order, the government was going to take important and long-lasting measures to bring down the cost of doing and ensure ease of doing business. "At least, I shall fulfill my promises and will make every effort in this regard," he said. He said the PTI government was taking concrete measures on short and long terms to provide a business friendly environment, including security to life and property of the business community and the people in general. After maintaining law and order in the country, he said, elimination of corruption was imperative to attract local and foreign investment. The president paid tribute to the Pakistan Army and other law enforcing agencies for bringing peace and security in the country. He said Pakistan had now economically become a place of attraction for the world. There were potential areas for local and foreign investment and the government would provide a business friendly environment, he added.